Yes, I am a chocolate addict. Many people claim to be addicts, but do they eat it at least once a day? I don’t think so. It’s gotten to the point where it just gives me that little edge I need during the day. 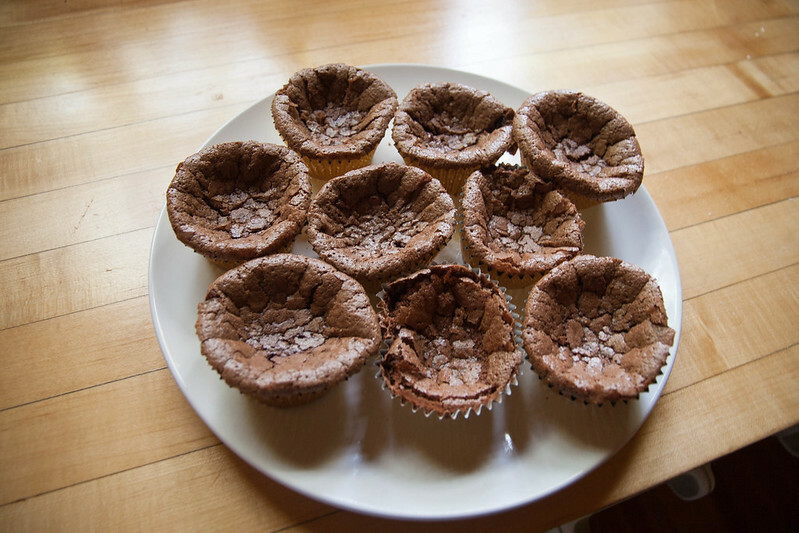 So once again, I was intrigued by a chocolate recipe, and once again, it was by dearest Deb from smitten kitchen. 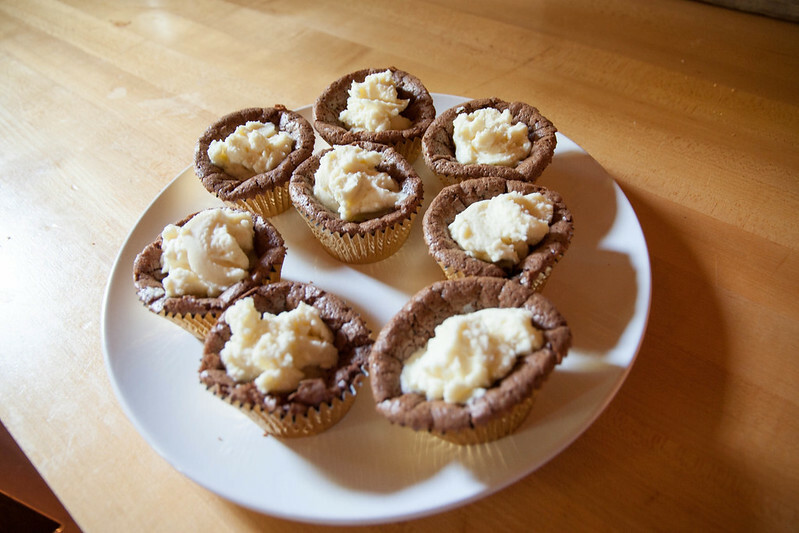 This one called for a chocolate soufflé in cupcake form with dreamy white chocolate mint cream: chocolate soufflé cupcakes with mint cream. I happened to have some leftover Kahlua from the cappuccino cheesecake, so I decided that a touch of that in the white chocolate cream would be just the small kick I wanted. 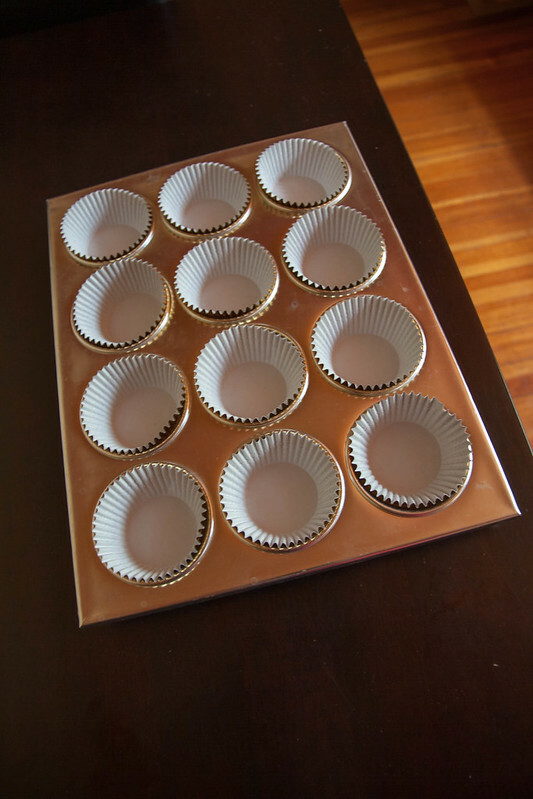 I’ve just really begun to delve into the baking world, and thus my baking specific supplies included baking sheets, a hand mixer (that I got for almost 70% off the regular price because it was incorrectly marked… lucky deal! ), mixing bowls, measuring cups/spoons, and some smattering of whisks, spatulas, etc. Anyway, a pretty basic kitchen. I bought a springform pan for the last recipe because I had a real urge for some cheesecake. 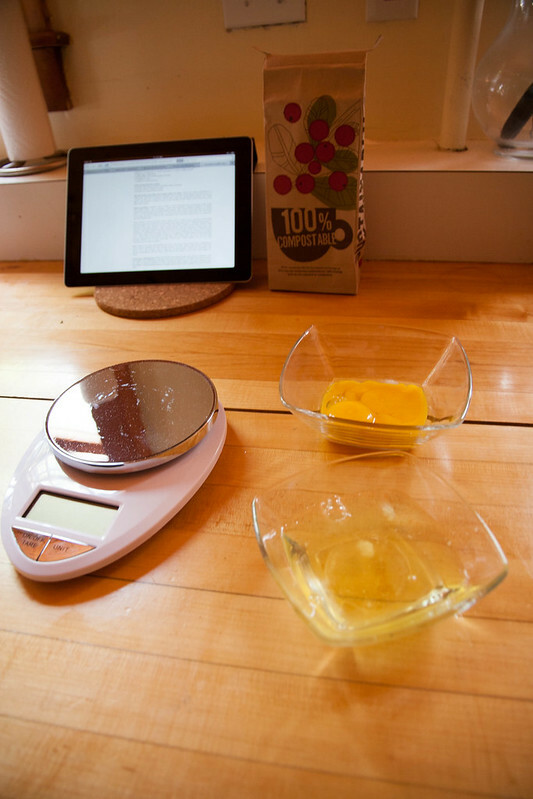 This was no different, although I was fortunate enough to receive a wonderful cast iron skillet and a kitchen scale (!) as a belated birthday present. 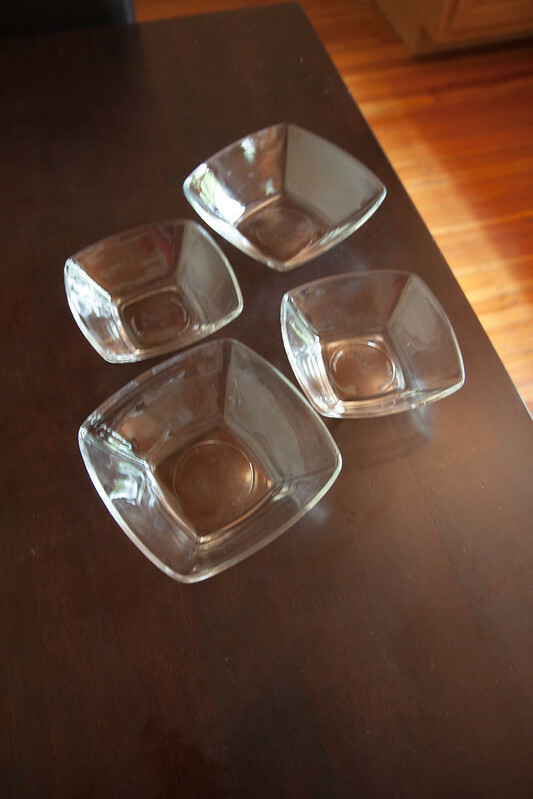 I guess it’s a trend… lacking the main baking utensil. So once again, I had to hit the pavement and search for utensils. 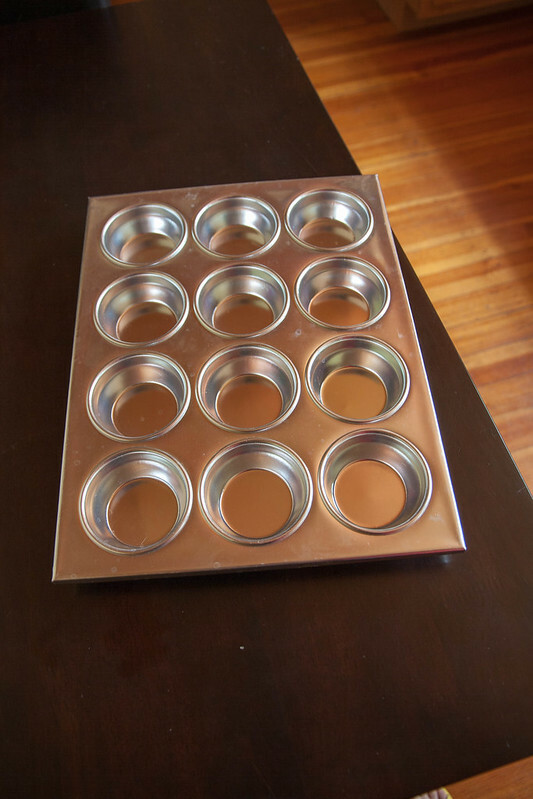 my brand new muffin tin! Onto the recipe! White chocolate cream base to begin, since it was slated to take 2 hours to chill. 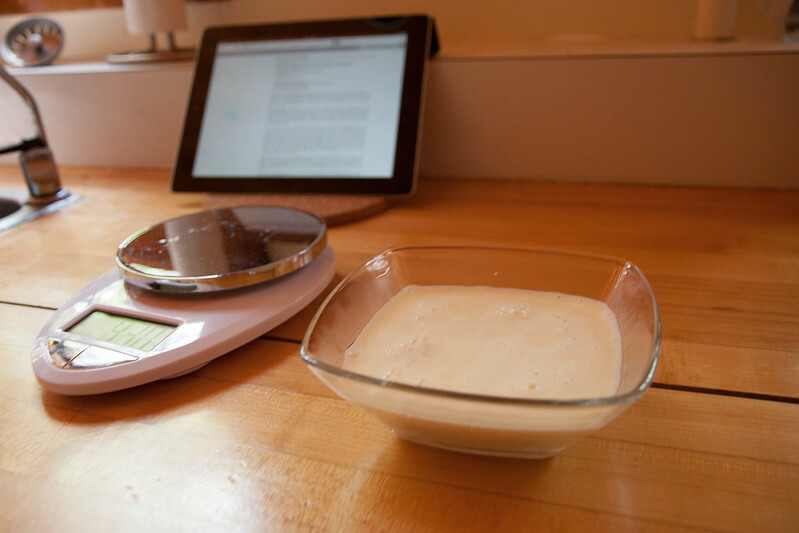 Originally, 3 ounces of whipping cream was utilized, but as I had some left over from the cheesecake, I used 4.6 ounces, or about 1.5 times the amount of ingredients. I simply adjusted the other amounts to even it out. 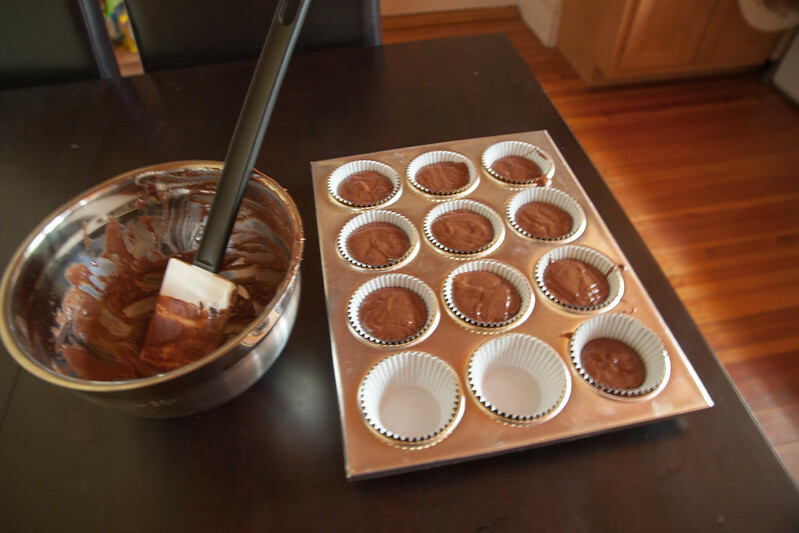 Chopped chocolate seems to be the ideal method for utilizing chocolate in recipes, doesn’t it? 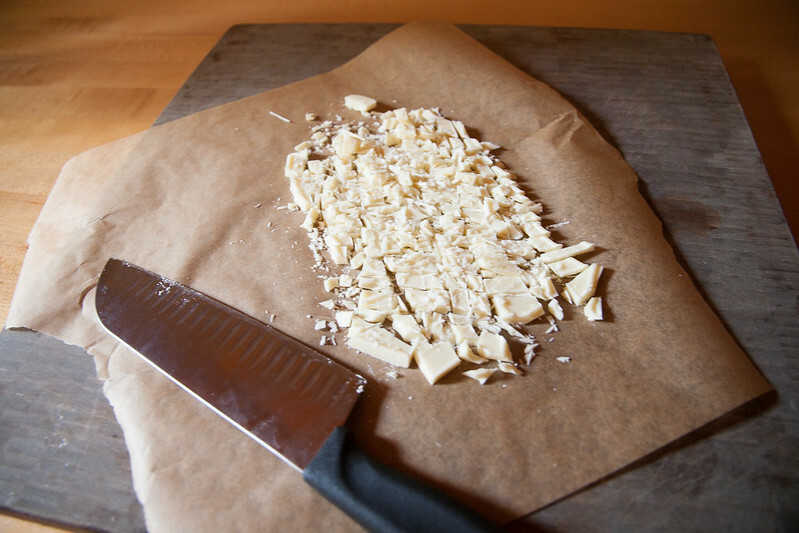 I did some more chopping with my santoku knife this time around as well, although I was chopping a white chocolate bar instead of dark chocolate. 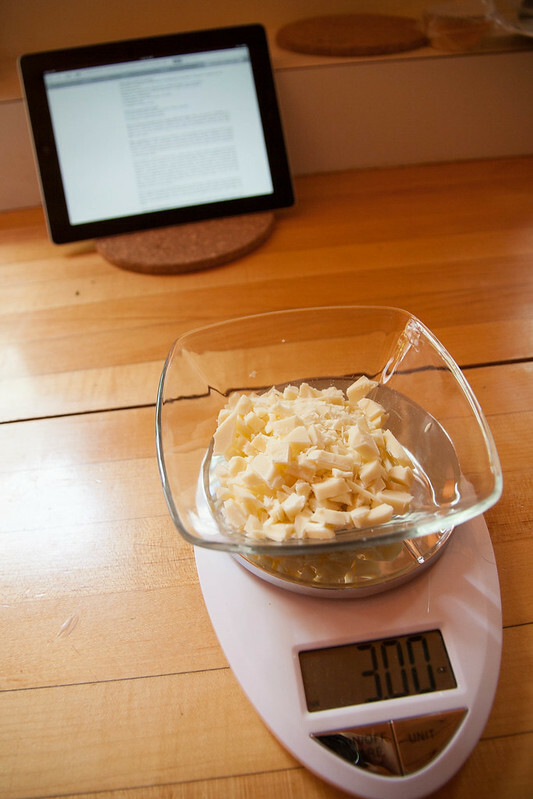 True to the adjusting amounts for the recipe, I added 3 ounces of white chocolate instead of 2. And then a dash or so of Kahlua for a bit of a flavor. All of this was happening while the cream simmered on the side; it was poured over the chocolate after it was done simmering, and off to the freezer it went. I chilled for about an hour and a half or so in the freezer, but you could chill in the refrigerator too. However, I personally liked the chill from the freezer. 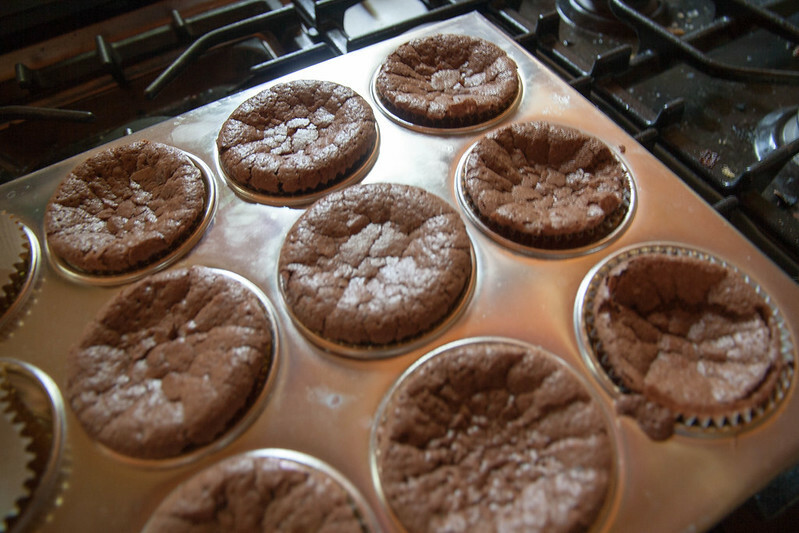 With that squared away, I went onto some soufflé magic. 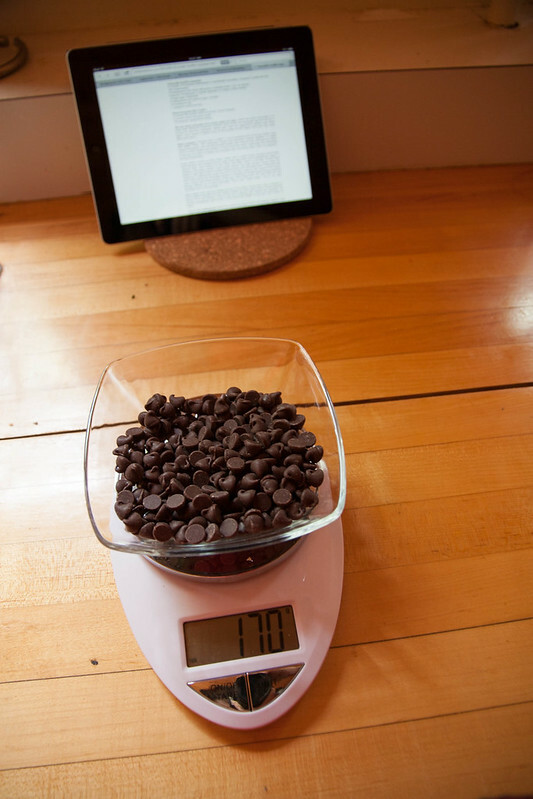 170 grams of chocolate goodness, 3/4 stick of butter, and some espresso beans created the base for the soufflé. While the chocolate buttery goodness was melting on the stove, I tackled some separated eggs. Separated eggs are a new thing for me. It actually went pretty well, given that it was my first shot. One yolk broke a little bit in the process, but some egg whites never hurt anyone. Next was the foamy mixture of egg yolks and sugar. I cut the sugar by 25% or so; 80 grams total instead of 97 grams. Feedback from the cappuccino cheesecake prompted me to attempt less sugar here. 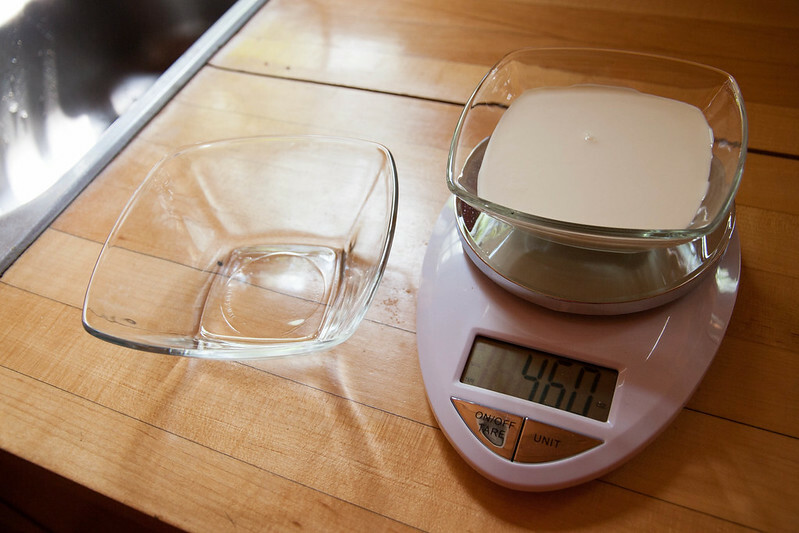 Half of the sugar was to be in this fluffy mix, thus the 40 grams. 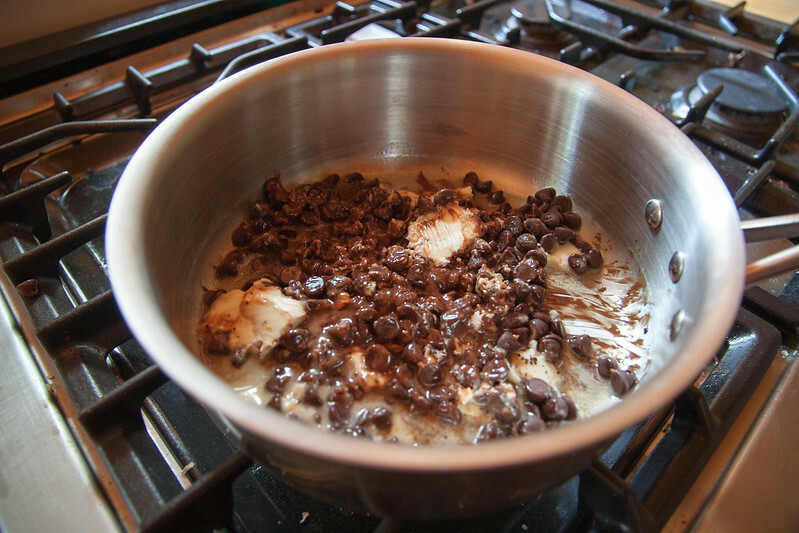 The chocolate was pretty well mixed melted, so I whisked it a bit and transferred to a mixing bowl. 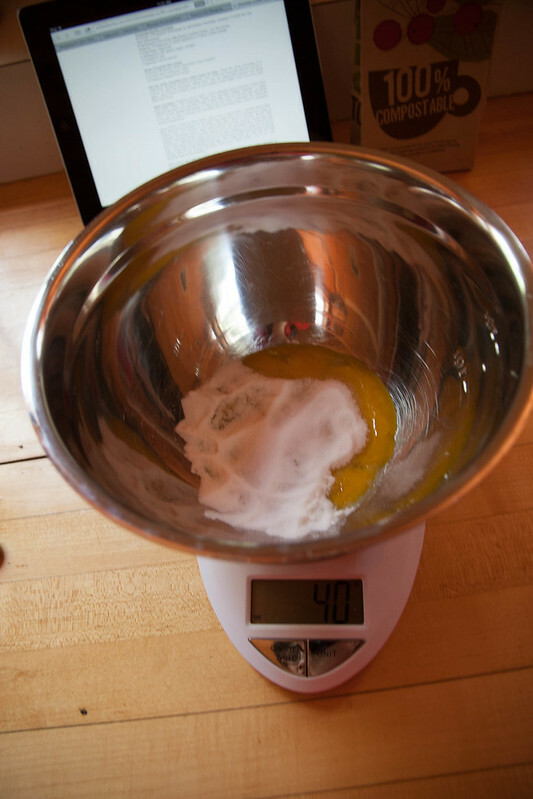 All that was left was mixing some egg whites and sugar… except that I was most uncertain during this part of the recipe. 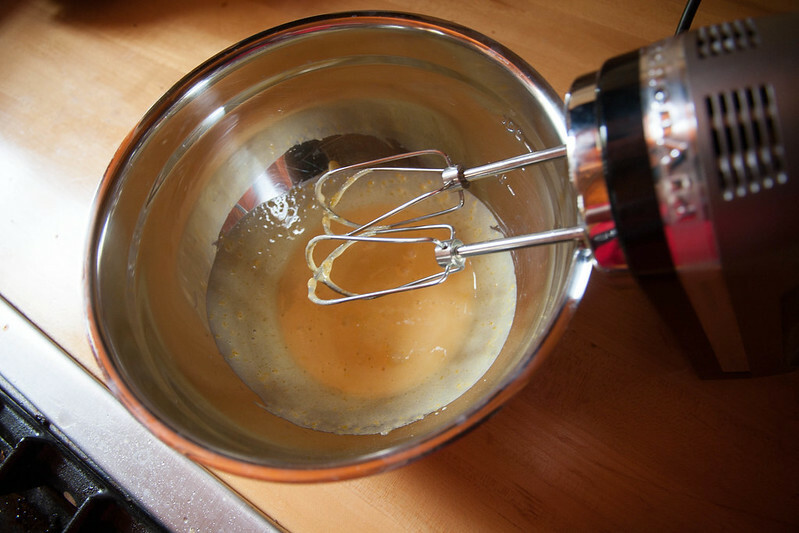 I never know what speed to whisk on, or what to do to get the egg whites to mix well with the sugar. The recipe originally called for the egg whites to be mixed themselves; after about 10 minutes of whisking the egg whites to achieve “soft peaks”, I gave up and just added the sugar and salt. 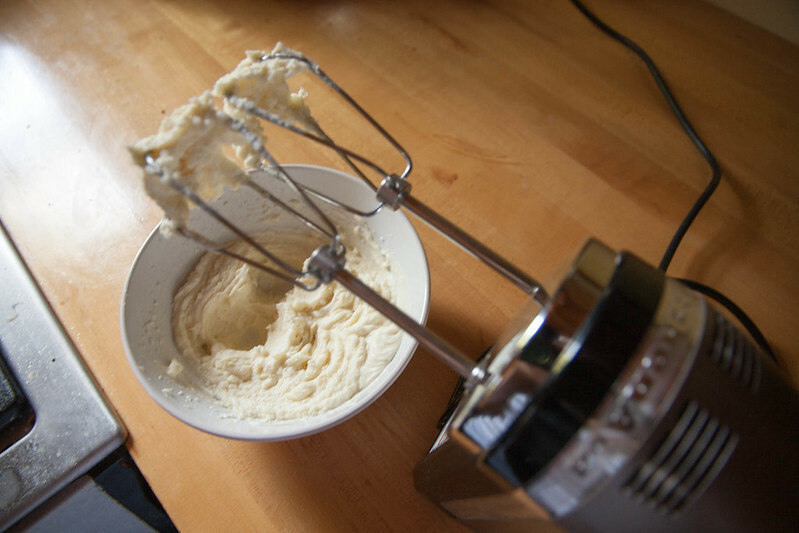 I was getting discouraged after another 10 or so minutes of whisking this, until I decided to up the speed on my 7 speed hand mixer to 5 instead of 1 or 2. This made all the difference. 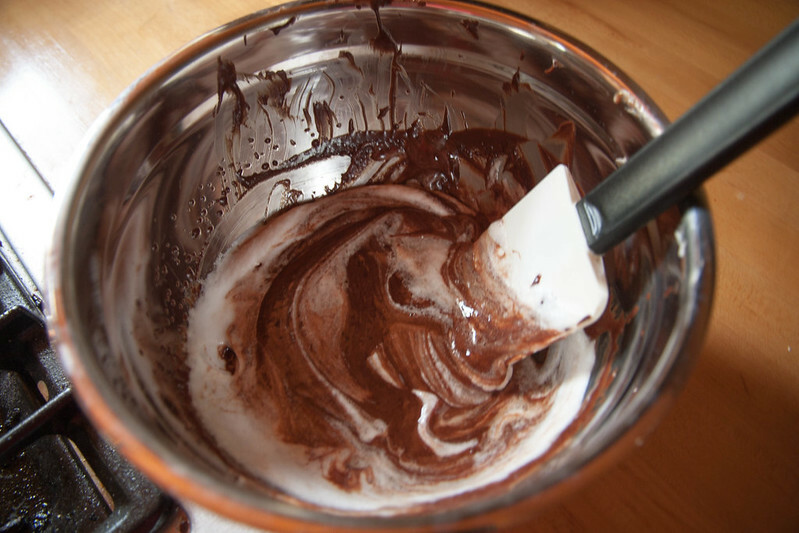 Whisking at this speed got me the consistency of medium peaks that I was looking for, and got a nice, fluffy texture that I could fold into the chocolate. 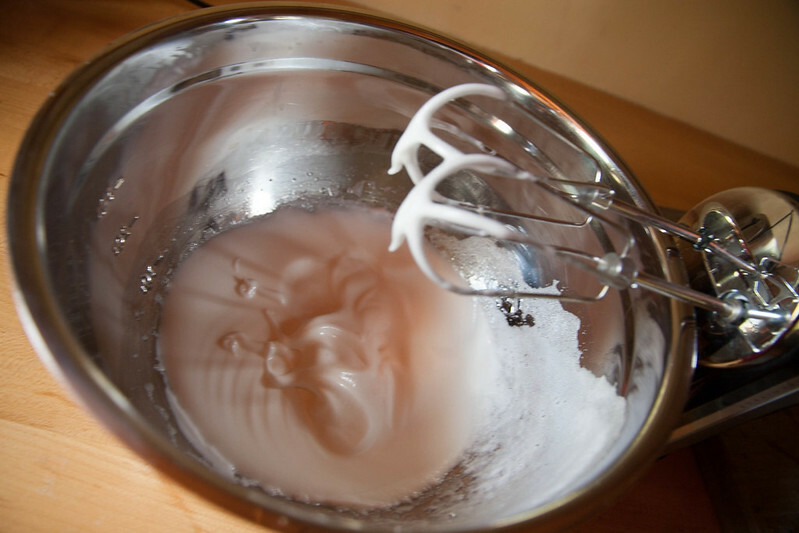 whipped egg white and sugar peaks… took forever! After folding in 3 batches, I was ready for the pan. It was a little bit messy, but as it’s my first attempt at pouring cupcakes, I think 2 or so mistakes are forgiveable, don’t you? Into the oven they went for 16 minutes (and probably could have been longer than that, but I was worried about the quick heat transfer from the aluminum to the cupcakes). 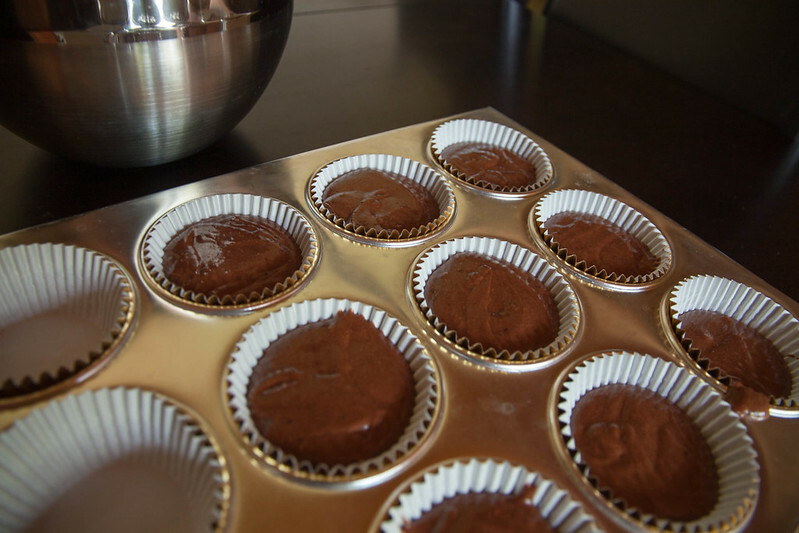 After coming out of the oven, the cupcakes almost immediately started deflating… perfect. … and we came out with a delicious masterpiece! Don’t leave the white chocolate/heavy cream mix in the refrigerator for more than a day… the white chocolate will start to get grainy, and that isn’t that fun in cream :(. But still delicious! Somehow, these will have to keep until Father’s Day… true test coming up!